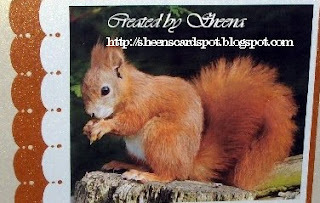 This was a wee bit difficult to make into a card but fortunately the lady liked what I did. She just loves watching the red squirrels outside her window. Was difficult to decoupage cos I had a problem seeing the 'obvious' cutting lines! Oooooo sometimes I just think I think too much about things instead of getting on with it!! lol. Martha Stewart punch again for the edge of the layers. 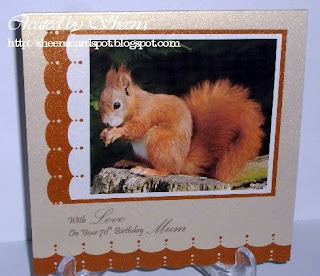 Lovely card brilliant squirell my neighbours would love it ... Love the use of the Matha stewart punch too.